Artists for Peace and Common Understanding between the Peoples of the Middle East and the United States. On April 6th, 2013, we will celebrate the life and accomplishments of Ambassador J. Christopher Stevens with live jazz and an exhibit of original art with an emphasis on Middle Eastern artists and themes. Chris loved the land and cultures and of the Middle East and North Africa; he went beyond the walls of the Embassy to learn first hand the concerns of the people. Secretary Hilary Clinton referred to him as a “Jazz Diplomat,” always improvising the next stage of conversation and collaboration as he made friends for the United States. We will also be holding a sub-exhibit of small works of art from friends, relatives, and artists touched by Chris’s story. 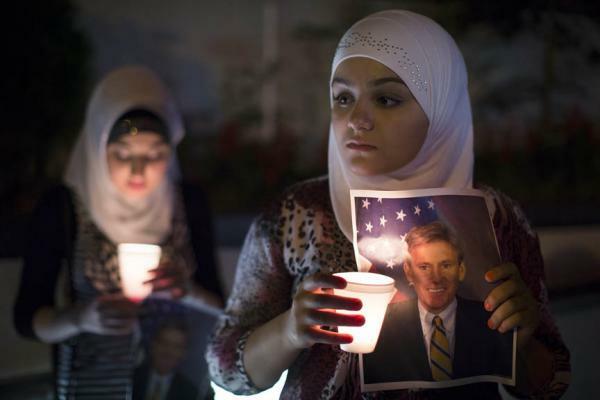 Chris Stevens will always be remembered by his friends and family for his post cards from foreign lands. As early as age 7, he sent postcards to keep in touch and maintain relationships throughout the years. We wish to continue in the tradition of this democratic art form – anyone can enter, and all entries received will be included in this exhibition. The small works can be visual, written word (memories, poetry), or combinations. All entries must be postcard size with postage attached. Overall the exhibition will bring together artists from around the world with the goal to create a lively, visual dialogue about peace and cultural acceptance between the United States and countries of the Middle East and North Africa, which we hope will continue to grow long after the exhibition is over. Chris had a passion for building bridges between the peoples of the Middle East, North Africa, and the United States. In this spirit a fund has been established in his name to support his important, yet unfinished, endeavor. All proceeds from the exhibition will go toward the J. Christopher Stevens Fund (see www.rememberingchrisstevens.com). Entry Procedures for Artists for Peace and Common Understanding Between The Peoples of the Middle East and the United States Exhibition. 1. Send image, no greater than 1 megabyte, to the natsoulasgallery.am@gmail.com. accompanied by a text document with name of artist, title of work, year created, medium, and dimensions. Please write “Stevens Art Exhibition” in the Subject line of your email entry. All medium, except video art, will be considered. Image and information must be received by March 15. You will receive acceptance or rejection notice from the jurying committee within one week. 2.Work accepted must be ready to hang or install and be received at John Natsoulas Center for the Arts, 521 First Street, Davis, CA 95616 by Saturday, March 30th, 2013. Entry Procedures for Artists for Peace and Common Understanding Between The Peoples of the Middle East and the United States Post Card Exhibition. This Post Card Exhibition will give family, friends, and those touched by Chris Stevens and his work an opportunity to send a memory or tribute; all imagery and written word will be accepted. 1.All work for the exhibition must be postally mailed without an envelope with postage on the actual piece of art and received in Davis by March 30. Work may be viewed online at www.natsoulas.com during the exhibition. All submitted work will remain the property of John Natsoulas Center for the Arts. 2.All work should be mailed to: John Natsoulas Center for the Arts, 521 First Street, Davis, CA 95616.